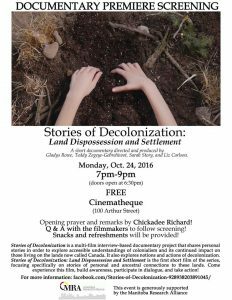 All are welcome to attend the premiere screening of the MRA-supported documentary Stories of Decolonization: Land Dispossession and Settlement. Directed and produced by Gladys Rowe, Teddy Zegeye-Gebrehiwot, Sarah Story and Liz Carlson. Please see poster for details, or to the Facebook page. We hope to see you there!